We are very excited to welcome Ruslan as an Associate Professor to the Machine Learning Department. His primary interests lie in artificial intelligence, machine learning, deep learning, and large-scale optimization. His main research goal is to understand the computational and statistical principles required for discovering structure in large amounts of data. He is an action editor of the Journal of Machine Learning Research and served on the senior programme committee of several learning conferences including NIPS and ICML. He is an Alfred P. Sloan Research Fellow, Microsoft Research Faculty Fellow, Canada Research Chair in Statistical Machine Learning, a recipient of the Early Researcher Award, Connaught New Researcher Award, Google Faculty Award, and is a Senior Fellow of the Canadian Institute for Advanced Research. Ruslan Salakhutdinov received his PhD in computer science from the University of Toronto in 2009. 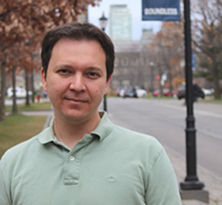 After spending two post-doctoral years at the Massachusetts Institute of Technology Artificial Intelligence Lab, he joined the University of Toronto as an Assistant Professor in the Departments of Statistics and Computer Science.